Filed to: Can you smell what this pop-up camera is cookin?Filed to: Can you smell what this pop-up camera is cookin? Can you smell what this pop-up camera is cookin? In the quest to kill the selfie cam, or at least hid it a bit better, we’ve seen companies design phones with motorized pop-up cameras, mechanical sliders (both manual and automatic), and even dual displays. But on the upcoming Reno, it seems Oppo’s goal was to make a pop-up camera that looks like The People’s Eyebrow. Or to put it another way, the Reno’s alleged pop-up camera looks like the awful No Fear logo you used to see on clothes back in the ‘90s. Now, just to be clear, the Reno has yet to be officially announced, and the image above comes by way of Slashleaks, which discovered the picture as part of what appears to be a leaked case ad for the Reno. 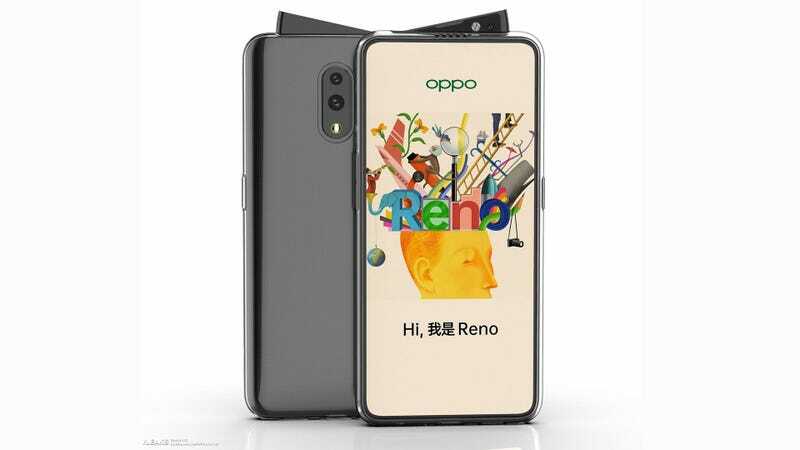 However, combined with the leaked video seen above and rumors of an Oppo launch event scheduled for next month, it seems pretty likely that the Reno and its alleged raised-brow cam will make its official debut sometime in April. While the Reno’s apparent appearance is certainly, shall we say, aggressive, it doesn’t seem to alleviate the main concern about motorized pop-up cameras: their durability. It’s not impossible that Oppo could add in a tiny lip that would allow you to pry the camera open with a fingernail or something if the motor fails. Then again, that’s not really a comforting or very practical solution either. But perhaps the biggest takeaway is that at least for the time being, the motorized selfie camera doesn’t seem to be going away, as some folks including me thought it might after checking out devices like the Oppo Find X. And with rumors that OnePlus is also adding a pop-up camera to the upcoming OnePlus 7, the whole trend actually seems to be gaining momentum. Can you smell what Oppo is cooking?